Lindsay O’Connor is owner of the Irene Leigh boutique in downtown Saratoga Springs. A career in fashion is something many people dream of. Lindsay O’Connor took her dream and made it a reality through hard work and a commitment to her vision. O’Connor is the owner of Irene Leigh, a women’s leisure and athletic wear boutique at 454 Broadway in downtown Saratoga Springs, inside the Saratoga Marketplace. O’Connor said the idea for the store and the name dates back to her childhood. A native of Niskayuna, O’Connor said she started planning Irene Leigh when she was in the fifth grade. “As a kid, I was always interested in fashion, coveting fashion magazines and learning to sew my own clothing. The name ‘Irene Leigh’ is a combination of my middle name and my cousin Brianna’s middle name. We dreamed as kids of being able to own our own store someday and the name stuck,” said O’Connor. After graduating from Niskayuna High School, O’Connor moved to Blacksburg, Va. to attend Virginia Tech. She then worked as a recruiter in Charlotte, N.C. for a few months, but realized she needed to take a leap of faith and follow her instincts, which were pointing her to the fashion industry. “I realized that my true passion was for fashion and the retail industry,” O’Connor said. She then began to make her path, working in a small jewelry boutique and as a manager at a clothing and accessories boutique in Charlotte. She then moved to Denver, where she began to find her niche in the fashion and retail industry. “I was just 23 years old and full of wanderlust … I packed up what I could in my Green Ford Focus and drove West to Denver. Denver was thriving, exciting and full of adventure. In Denver, she worked as an assistant store manager of a clothing boutique. After a few months she was promoted to manager. “With the goal in clear focus, I knew I wanted to gain more business experience, specifically in corporate retail,” she said. O’Connor eventually took a position in San Francisco with the Gap. After 11 months working in an Old Navy store, she was offered a position as an inventory analyst. After two years, she was chosen to be the associate buyer, covering Great Britain and European. In 2015, she was offered a position in merchandising at Talbots in Hingham, Mass. “I was excited to be back on the East Coast and closer to home, as well as to get the position of a merchant, the last box I wanted to check off before opening my own store. In the role of merchant for a specialty retail company you are involved in every aspect of the business from initial design conception, sourcing and development, product strategy and selection, as well as financial strategy and analysis,” said O’Connor. She said during that time, she held on to her goal of eventually opening up her own business and she felt Saratoga Springs would be the perfect place. “Growing up near Saratoga, I have always known what a special place it is. As a kid, when I dreamed of owning a store, this was always where I visualized setting up shop. As I have lived and traveled all over the county, I find boutique culture to be the best and strongest in towns like this, with exceptional support from the local community and new customers visiting all throughout the year,” she said. The boutique carries an assortment of workout wear and casual clothing, jewelry and accessories. They carry active-wear brands that support yoga, spin or barre class, or just “chasing the kids or grand-kids around the house”, said O’Connor. “We aim to provide our customers with special, unique, and well-made pieces that they want to live their lives in,” said O’Connor. “Saratoga Springs has a thriving, active community with studios and clubs offering every type of group fitness classes, including yoga, barre, spinning, running, high intensity interval training classes and more. 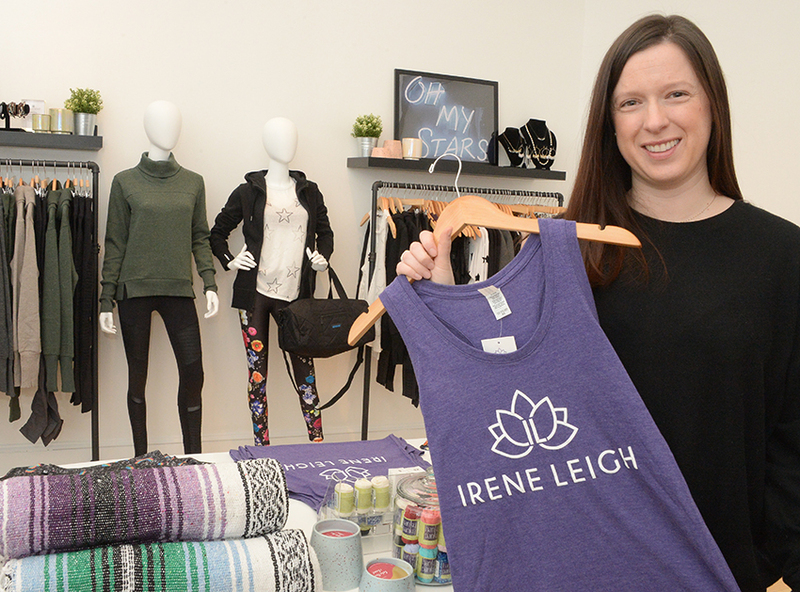 Irene Leigh is the only store downtown to provide a focused product that is dedicated to an active lifestyle,” said O’Connor. Spring Hours for the store are 10 a.m. to 6 p.m. Tuesday through Saturday and from noon to 5 p.m. Sunday. Visit ireneleigh.com for more information.